It’s been two years since Future Pro Wrestling ran their first show in the Wallington Halls and on Sunday 12th May 2013 they crowned their first ever Champion with an eight man title tournament, the combatants of which were decided in a 21 man battle royale at February’s Reloaded 2 show. Matt Burden welcomed the packed out crowd to the show and then brought out co founders Steve Heavy D Evans and belt designer Lee Elmer with the championship belt. Then it was straight into the action with FPW fan favourite Jimmy Havoc first in the ring to take on TNA British Boot Camp competitor “Party” Marty Scurll. Marty had clearly been partying far too much as he didn’t know who Jimmy was, which only served to anger Mr Havoc who soon grew tired of Party Marty’s actions. After some great back and forth action it was Havoc who got the upper hand winning by pinfall and advancing to the semi finals. Marty offered Jimmy his hand at the conclusion of the match but Havoc slapped his hand away and offered the crowd a Stone Cold style salute as he left the ring. Second match up was British Wrestling’s shining star Noam Dar against the 6ft 4” Lord Of The Rings member Joel Masters. The crowd were on the side of the massive Masters, despite his association with The Lords Of The Ring, especially as he has had a run in with Dar at the last two FPW shows. Noam was rightly apprehensive at facing the much bigger Masters and even asked if anyone else wanted to fight him as he was “huge”. This was a great match and it was interesting to see Noam playing it for laughs as he is a very funny guy! Some wonderful comedy touches included Noam standing on a chair for a test of strength and then Joel doing likewise, also Noam asked Joel if he or Joel were the bad guy? Dar eventually worked on Masters’ legs trying to set up the champagne superkneebar and spat water in Masters face. This infuriated the big man who managed to overpower Dar with his superior strength, but he couldn’t get the pin fall on the wily Scot. Then Noam channelled the late Eddie Guerrero when he threw a chair to Masters and feigned being hit which led referee Chris Roberts, who didn’t see the incident, to call for the DQ. But ring announcer and co owner Matt Burden informed the ref what had gone down, the match was restarted and Masters gained the pinfall with a huge chokeslam for the 123. Next up Sir Thomas Chamberlain took on Mexican sensation El Ligero and if wrestling one of the UK’s finest grapplers wasn’t enough for the Mexican sensation, Sir Thomas was accompanied by fellow Lords Of The Ring member Earl Jonathan Windsor. Chamberlain gained the upper hand with the help of Windsor’s outside inference making the early moments more like a 2 on 1 match. Ligero came back and hit some high impact moves including an RKO but eventually succumbed to Chamberlains STF and tapped out. Last match for the opening round was Greg Burridge vs Mr IPW Ashley Reed. Burridge is the huge fan favourite at FPW and the crowd lapped up every second of his entrance. This was a fast paced match which Reed lost in just over five minutes by pinfall after a Rock Bottom by Burridge, many people’s favourite for the title. After the interval we were straight into the semi finals and Joel Masters faced his Lords Of The Ring leader Sir Thomas Chamberlain. With the crowd waiting with baited breath for Masters to flatten the much hated Chamberlain, Sir Thomas said to him “you know what to do”. The crowd were fully behind Masters and did not believe that he would forgo his chance to be champion, but in a move that stunned the Wallington crowd he lay down, took the pinfall and exited the ring. He then returned seemingly looking to exact some revenge, but he chose to leave meaning Chamberlain was through to the final. Next up Jimmy Havoc returned with a change of tights and a massive change in attitude when he chose to attack Greg Burridge with a chair on his way to the ring. He targeted Burridge’s knee and worked it over on the outside for several minutes. When the action finally reached the ring Havoc continued working the knee but Burridge would not quit. Havoc reached for the chair again but Burridge kicked it into Havoc’s face and hit the Rock Bottom for the pin and so advanced to the final. Havoc continued his attack after the bell and Burridge had to be helped to the back, would he be fit for the final match up? 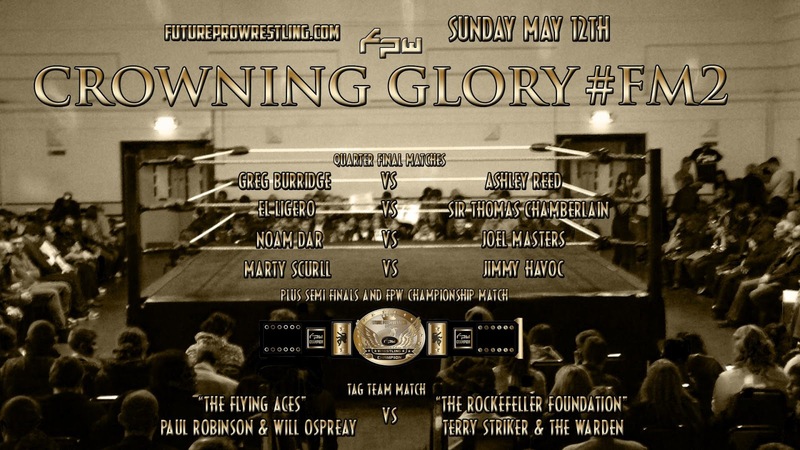 Before the final title match we had what many people thought was the match of the night when the Rockefeller Foundation of Terry Striker and The Warden, accompanied by DouglasDouglas Rockefeller, took on The Flying Aces combination of Will Ospreay and Paul Robinson. These guys put on a tag team clinic which the crowd lapped up and a fast paced 11 minutes of action was won with double Shooting Star Presses from the Flying Aces. Then we came to the big one, the winner of which would be crowned the inaugural FPW Champion! Burridge came out first and was once again attacked before he got to the ring this time by Chamberlain. These two fought all over the Hall - on the food table, on the merch table and even outside in the entrance !! Greg (sporting a Sin Cara mask from the merch table!) fought back from the early attack but the numbers game finally caught up on him as Windsor, Masters and even Havoc got involved. Finally this led to Burridge, despite the roar of the crowd, passing out in the STF and Sir Thomas Chamberlain being crowned the first FPW champion. Whilst the Lords Of The Ring celebrated in the ring, Steve HD Evans FPW co founder came out with Will Ospreay and Paul Robinson to announce that on June 8th at the St Helier Festival Chamberlain will defend his title against Paul Robinson in a FREE FPW mini show! Also Joel Masters will take on Will Ospreay, and Earl Windsor will face his old nemesis The Earl Of Excellence. Greg Burridge then stated his intent to get his rematch asap and take the belt from Chamberlain. A fantastic night of action with some really unexpected twists and turns, this was probably the best FPW show yet, and the standards are exceedingly high! FPW are back with the above free show at the St Helier festival on 8th June and the next show, on July 7th at Wallington Halls, will see the start of a 16 team tag tournament that will take place over four shows! Check these out on the Future Pro Wrestling Facebook page (www.facebook.com/FutureProWrestling) Website (http://www.futureprowrestling.com) or Twitter (@FPWuk).